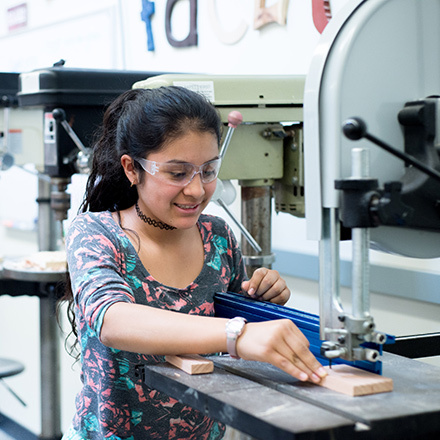 The GMS Summer Experience offers a dynamic and exciting program where a girl can discover her strengths and express her voice through a variety of interdisciplinary activities that include engineering, design, performance art, tinkering, making, and scientific inquiry. To ensure that the girls are fully immersed in the GMS experience, the summer program is created and taught by GMS faculty and alumnae. Space is limited. Register by March 10, 2019 to secure a spot! We will send a confirmation of your enrollment. If the camp is full, we will add you to our wait list. If you have additional questions, please contact us at summer@girlsms.org. Girls take ownership of putting on a full musical production. Over the course of the two weeks they have opportunities to design, create, build, and act by taking on the responsibility of set design and construction, choreography, stage management, performance, and costume design. Families are invited to attend the performance on June 28 at 5:30pm. We need GMS alums of all ages to help teach our STE(A)M Camp! We invite you to apply to be a GMS Summer Experience Leader and help create this vibrant experience. Girls draw on their critical thinking and problem solving skills to complete projects that are rooted in practical, hands-on exploration. Through collaboration and inquiry, girls engage in the iterative process to explore tinkering, engineering, science, making, and the arts. Our capstone project is centered around designing and building single-person boats and devices that the girls test on an all-day field trip to the beach. STE(A)M CAMP IS FULL for 2019! If you are interested, you can email summer@girlsms.org to be placed on a waitlist.